If you don't know what PCI Reading is, it's a reading curriculum designed specifically to teach students with disabilities how to read. We use level 1 in my classroom. In level 1, there is a total of 140 sight words (dolch words, fry words, and "real world" words) that students learn over a period of time through a lot of repetition and practice. It has been a game changer in my self contained classroom! Today I wanted to quickly talk about the other end of PCI Reading that I love: the comprehension piece. This is sold separately from the program, but is truly worth the extra money if your district will purchase it for you. Inside the comprehension activities, they touch on setting, main character, sequencing, main idea, making predictions, and drawing conclusions. ALL of these activities are based on the books that my students read throughout the PCI Reading program! Included in the comprehension piece, there are data sheets to keep track of individual student progress. Above you see an assessment checklist for numerous concepts of print such as identifying the cover, title, author, etc. Once one of my students finishes a new book in the PCI Reading program, we are then able to work on a whole new set of comprehension activities! Above you see numerous worksheets included for Book 3 "My Home on a Farm" such as cutting and pasting pictures from the book, identifying the setting, things on a farm, and completing sentences. Finally, for each book there is an assessment for comprehension of the book & a data sheet to go along with that assessment! Above you see the 4 question assessment for Book 3 and the data sheet to keep track of individual student progress. I LOVE how the assessments are multiple choice and visual for my students! In the comprehension sets, there are also lesson plans that help you plan and deliver the lesson and show administration what skills are covered in each lesson. Is there anything better than a lesson plan already written FOR you?! 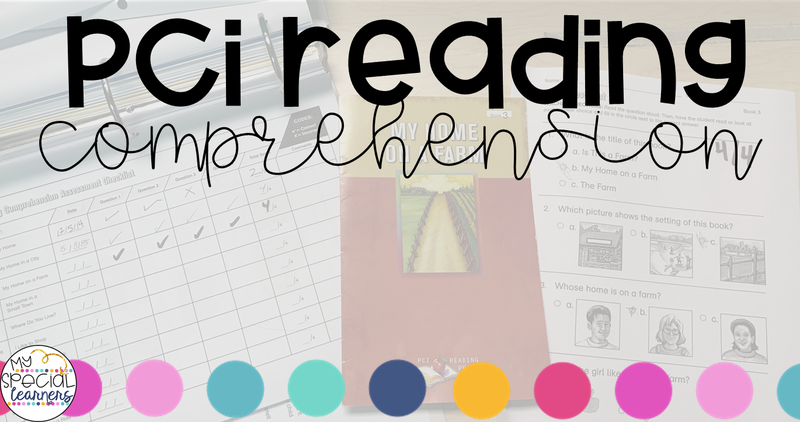 You can check out the PCI Reading Comprehension Activities HERE, where you'll also find a downloadable sample of a lesson to see if it's right for your students!